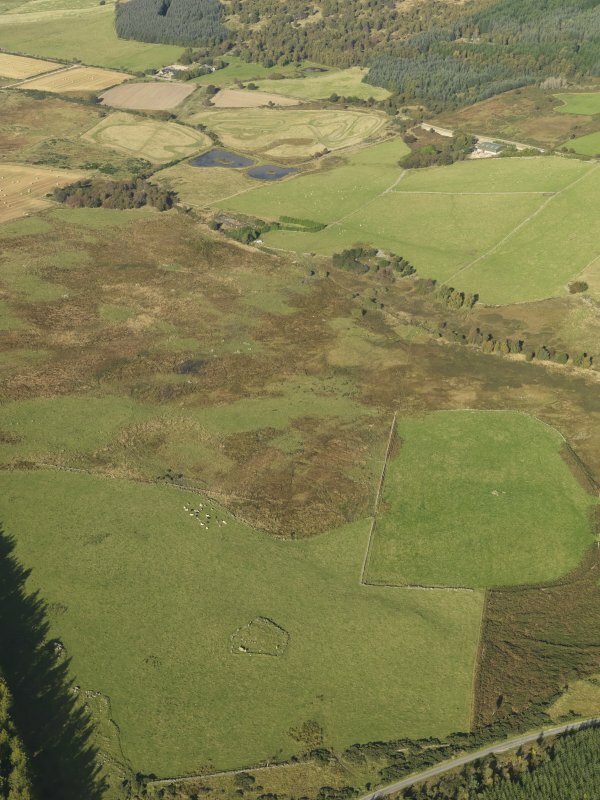 General oblique aerial view of the remains of Elsie the Greater Recumbent Stone Circle, taken from the ESE. Oblique aerial view of the remains of Elsie the Greater Recumbent Stone Circle, taken from the SW.
Oblique aerial view of the remains of Elsie the Greater Recumbent Stone Circle, taken from the SE. 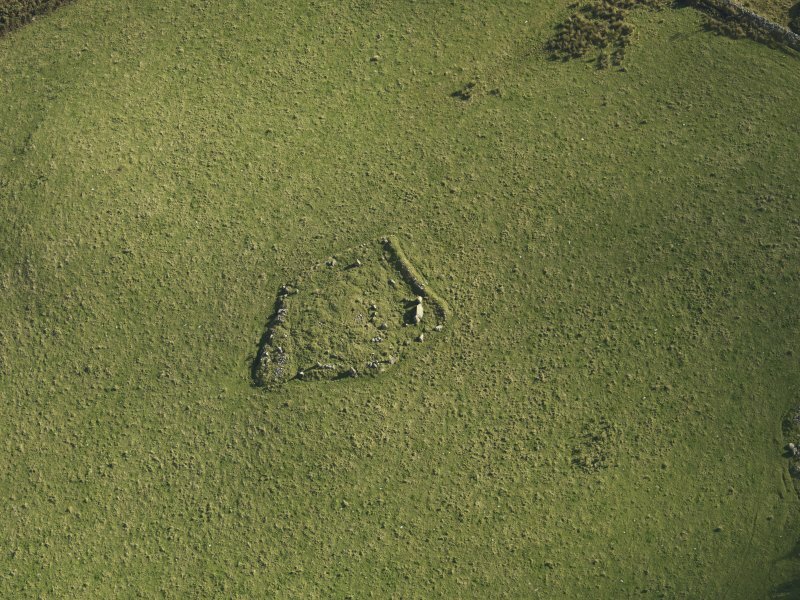 Oblique aerial view of the remains of Elsie the Greater Recumbent Stone Circle, taken from the S.
Oblique aerial view of the remains of Elsie the Greater Recumbent Stone Circle, taken from the SSW. View from the interior of the circle, looking south, showing recumbent stone, flankers and kerb of ring cairn. 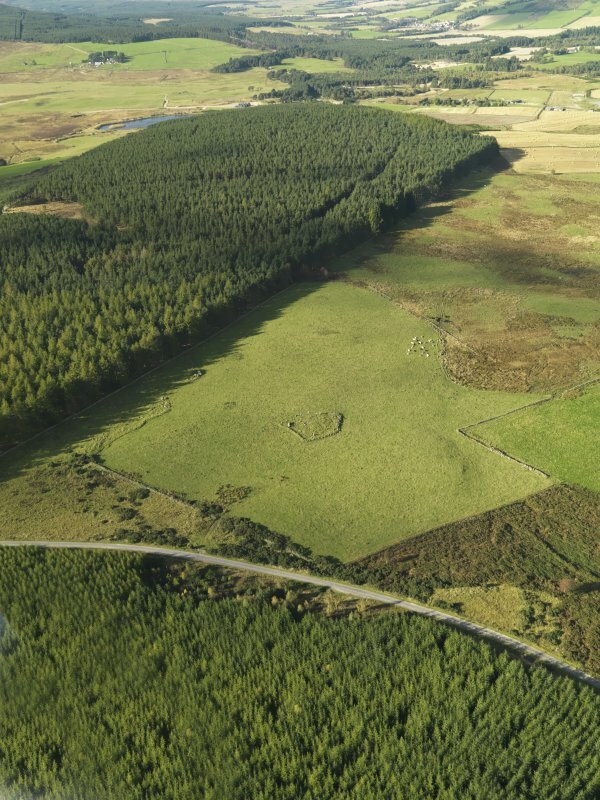 General oblique aerial view of the remains of Elsie the Greater Recumbent Stone Circle, taken from the SE. 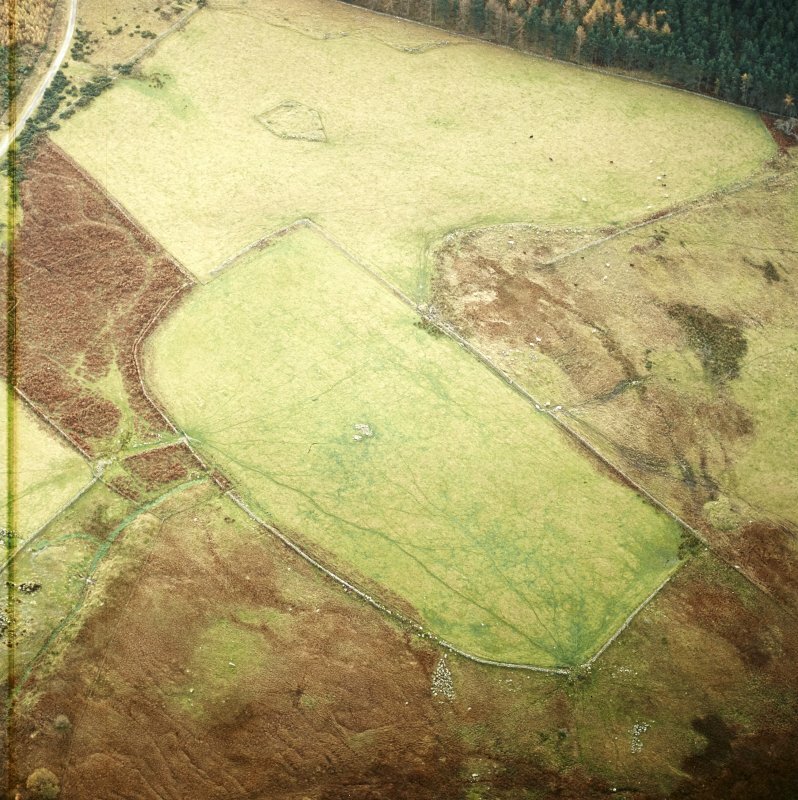 Oblique aerial view of the remains of Elsie the Greater Recumbent Stone Circle, taken from the WNW. General view. 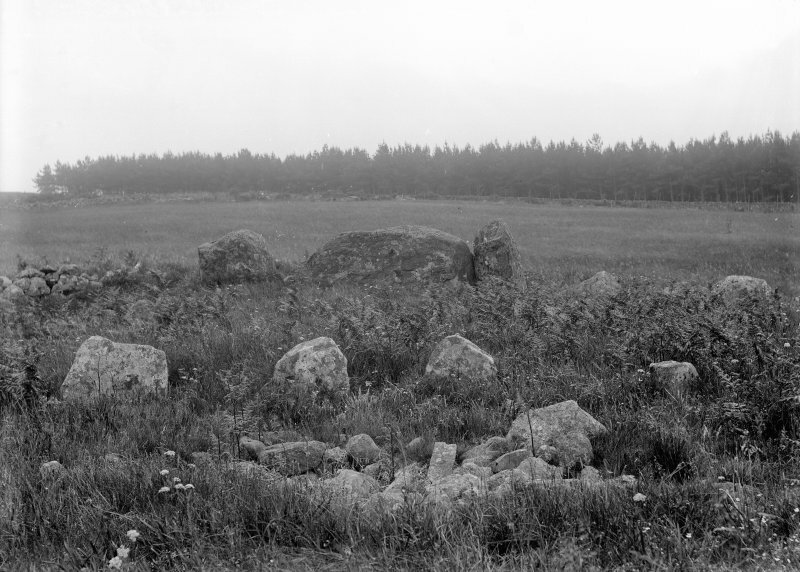 Original negative captioned: 'Esslie, the Greater Circle View from centre looking South showing stone setting July 1902'. 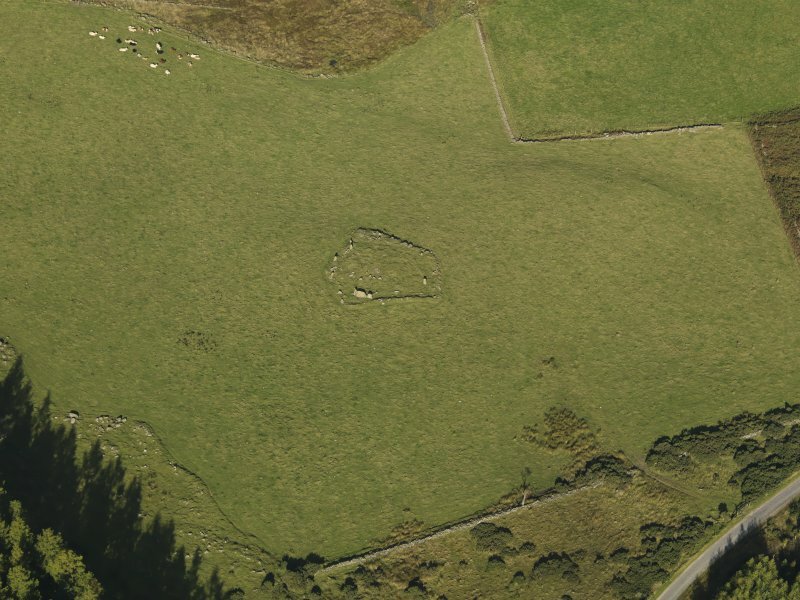 Oblique aerial view of the remains of Elsie the Greater Recumbent Stone Circle, taken from the N.
General view of circle. Original negative captioned: 'Esslie, the Greater Circle View from outside circle, looking North July 1902'. 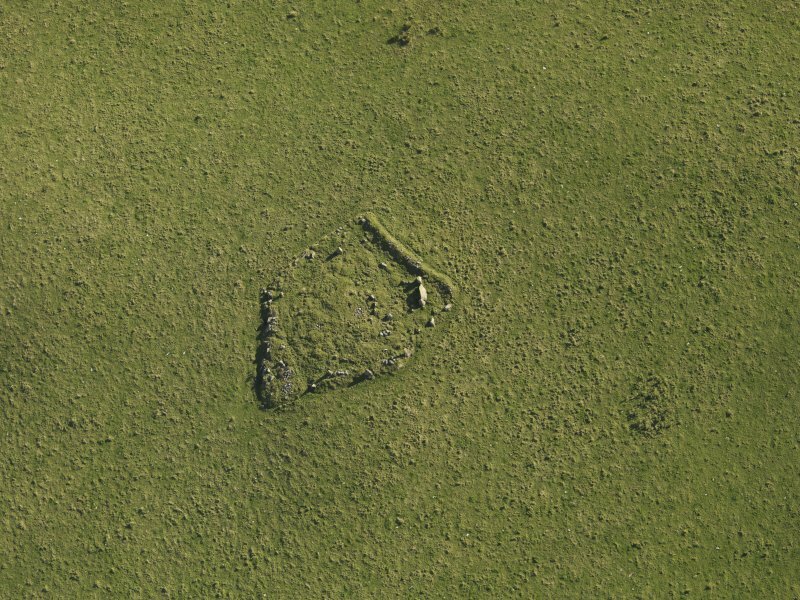 Oblique aerial view centred on the remains of the field-system and clearance cairns with recumbent stone circle and ring cairn adjacent, taken from the NNE. General oblique aerial view looking across the remains of Elsie the Greater Recumbent Stone Circle, taken from the E.
General oblique aerial view looking across the remains of Elsie the Greater Recumbent Stone Circle, taken from the ENE. 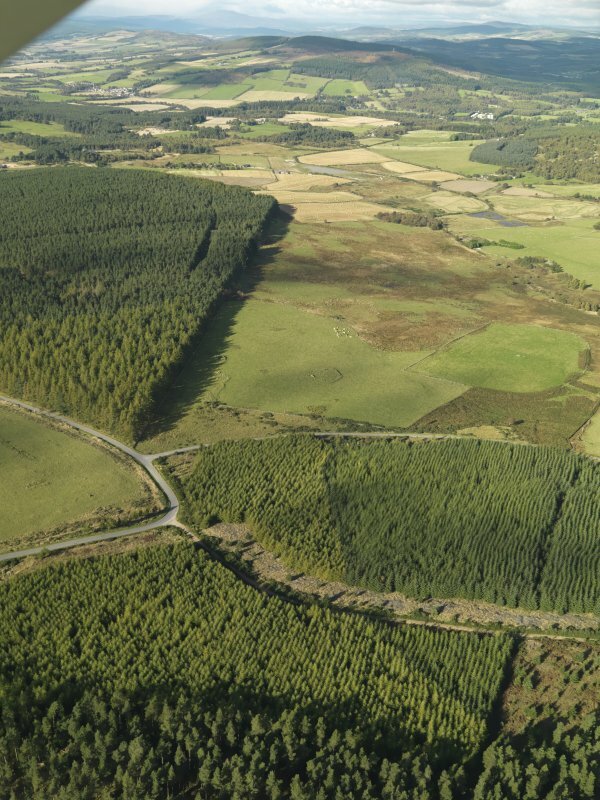 Oblique aerial view of the remains of Elsie the Greater Recumbent Stone Circle, taken from the SSE. 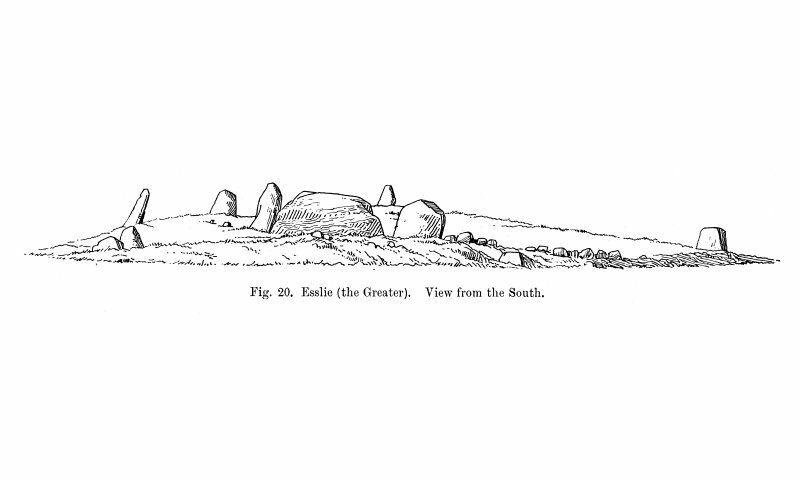 View of recumbent stone and flankers. 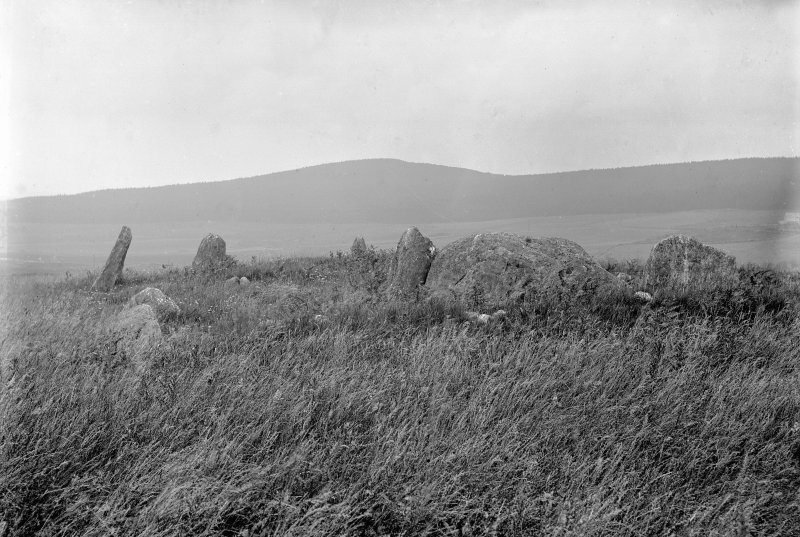 Original negative captioned: 'Recumbent Stone and Pillars of Greater Circle at Eslie, Durris / View from outside of circle 1907'. 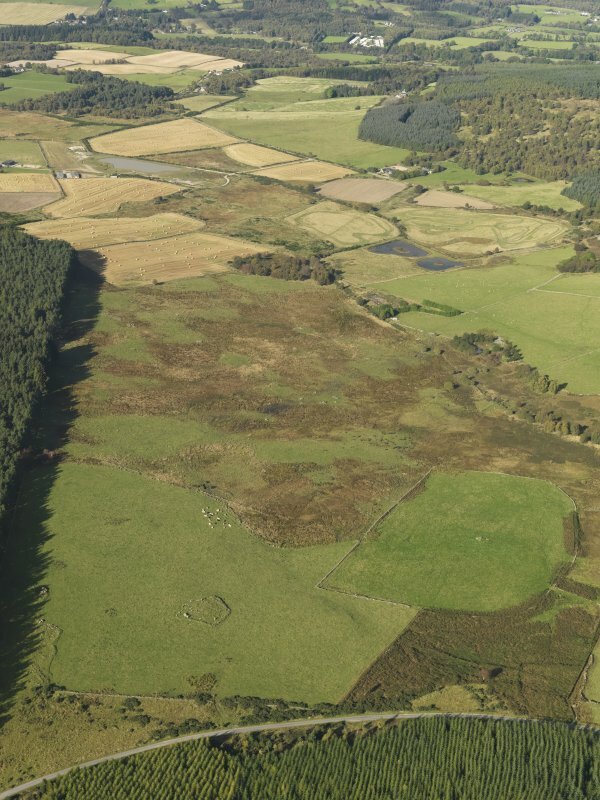 General oblique aerial view looking across the remains of Elsie the Greater Recumbent Stone Circle, taken from the NE. 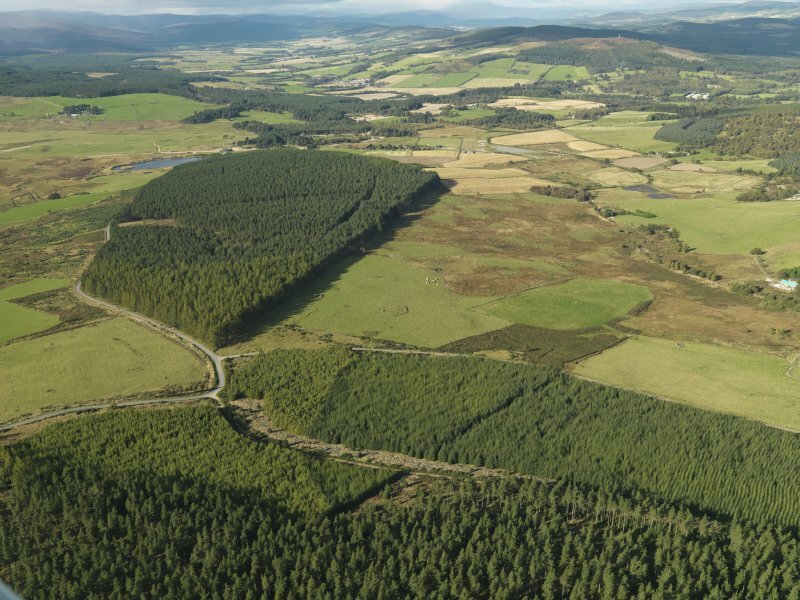 Oblique aerial view of the remains of Elsie the Greater Recumbent Stone Circle, taken from the NW. 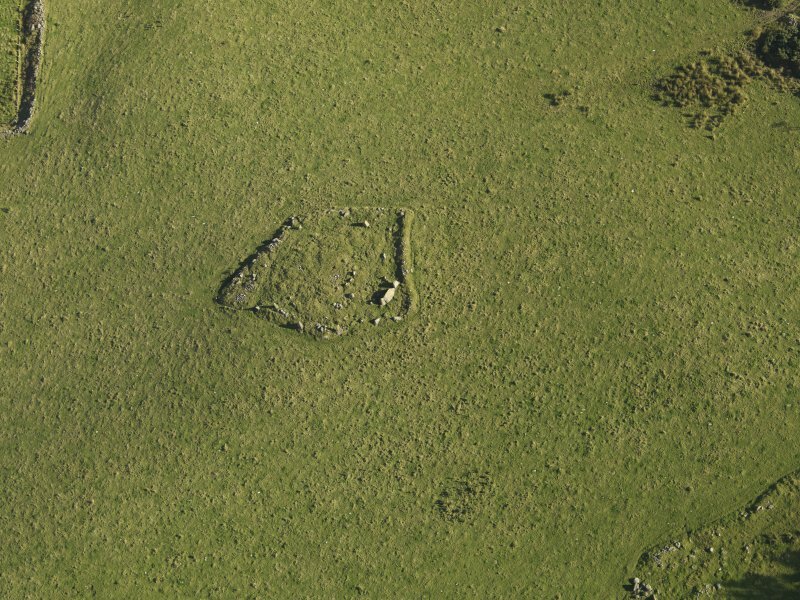 Oblique aerial view of the remains of Elsie the Greater Recumbent Stone Circle, taken from the W.
High-Spy view from the East showing Eslie the Greater recumbent stone circle. General oblique aerial view looking across the remains of Elsie the Greater Recumbent Stone Circle, taken from the ESE. 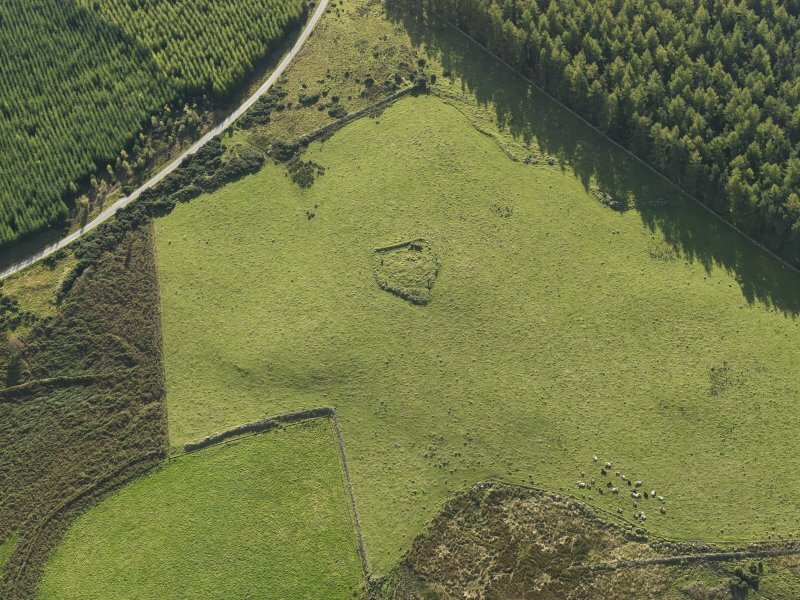 This recumbent stone circle encloses a heavily-robbed ring-cairn on a gentle N-facing slope 730m S of Eslie farmhouse. 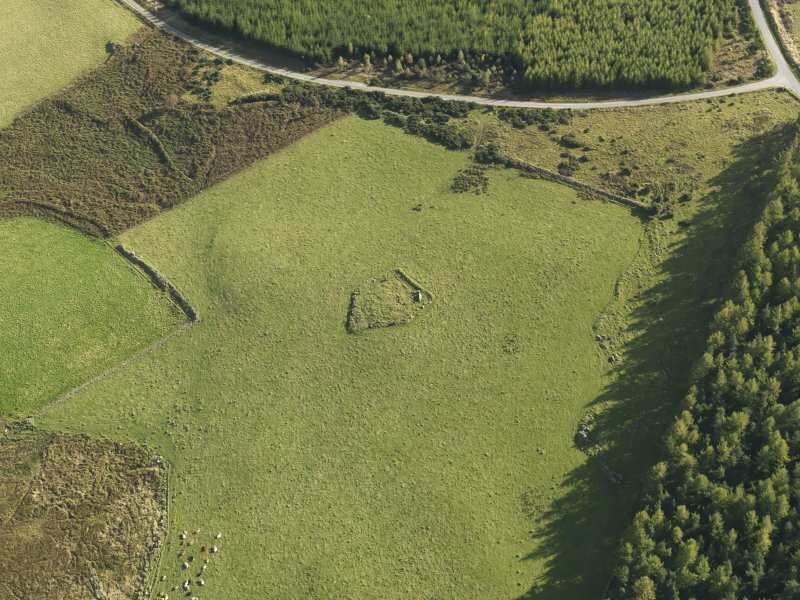 The ring-cairn measures 17.7m in diameter over all by 0.5m in maximum height and encloses a central court 6m in diameter; at least eleven outer kerbstones and twelve inner kerbstones (up to 0.6m high) are visible. The recumbent, which has a triangular section and measures 2.8m by 1m at the base and 1.3m in height, lies with its flankers on the line of the surrounding circle on the S; three boulders set in a line behind the E flanker may be the remains of a kerb linking the recumbent setting to the ring-cairn, and there is also a small slab set upright at the foot of the W face of the W flanker. 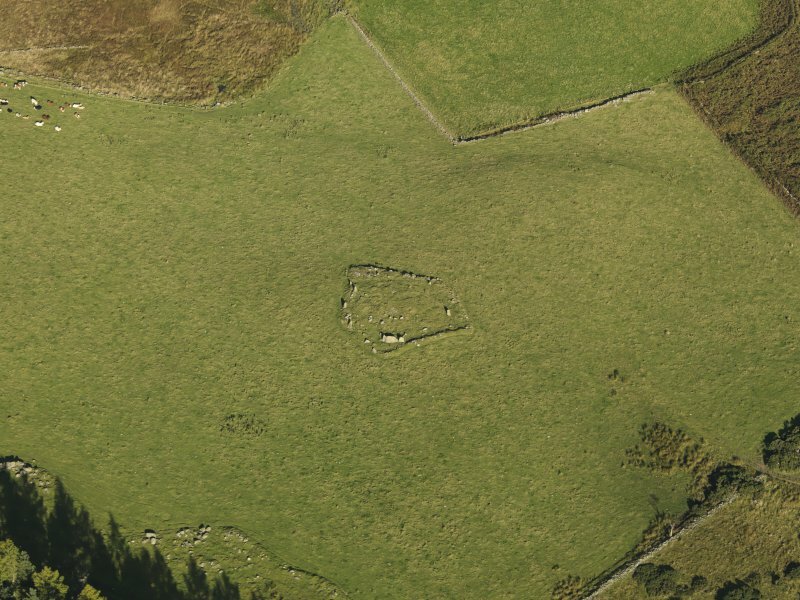 The surrounding circle measures about 22.5m in diameter and has been reduced to five upright stones from a probable total of nine. The stones do not appear to be regularly graded in height, but the tallest (1.9m) is on the SW and the shortest (0.9m) is on the NNE. In 1873 excavations in the ring-cairn revealed at least three 'dark marks.. the length of a not tall human being' together with small pieces of bone, and also a cist 'built of common boulder stones,..from 8 to 10 inches (0.2m to 0.25m) in diameter'; the cist contained 'black marks and pieces of bone'. Name Book 1864; R A Smith 1880; F R Coles 1900; A Thom, A S Thom and A Burl 1980; RCAHMS 1984, visited April 1984. Air photographs: AAS/94/15/G28/30 and AAS/94/15/G29/1-6. This well-preserved recumbent stone circle stands at 180m OD just below the crest ofa low saddle with wide VIews to the south and west. 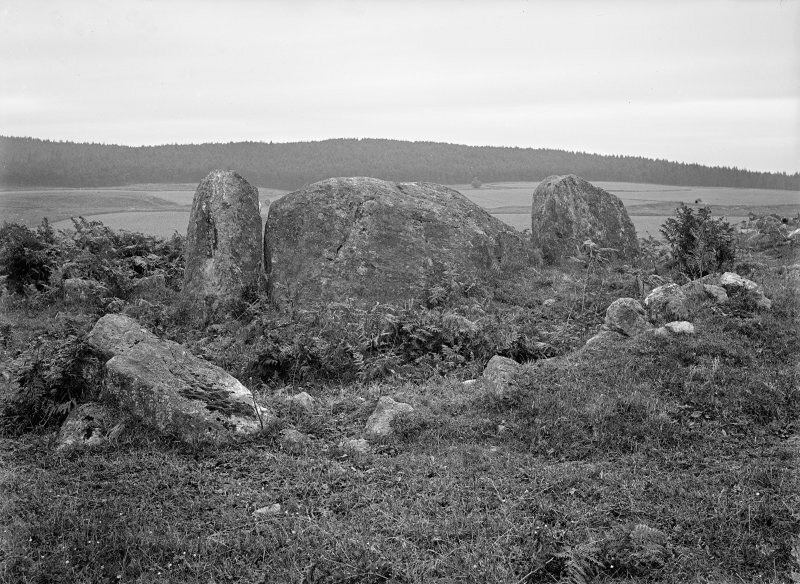 Of the eight original circle stones (plus recumbent and flankers), five still stand; they range from 1.5m to 0.8m in height, the one opposite the recumbent being, characteristically, the smallest. In plan the circle is an ellipse, 26.5m by 23.2m. 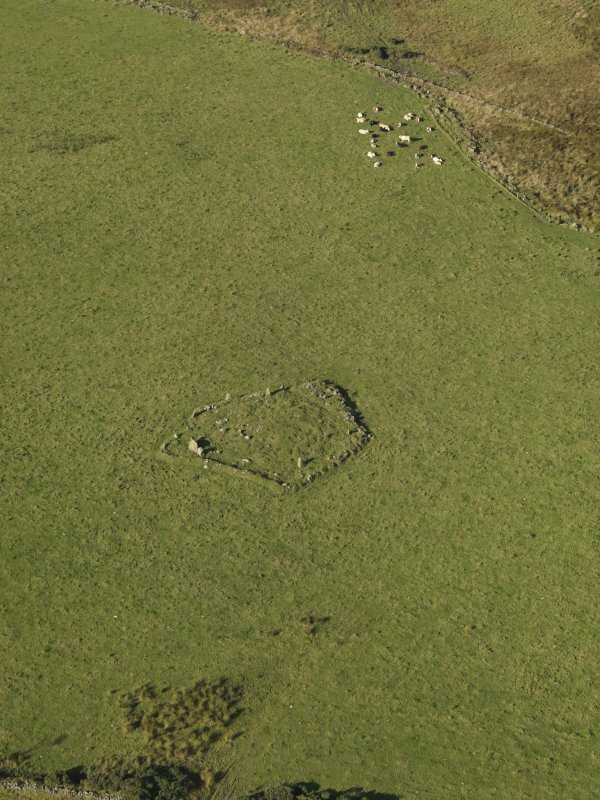 The enclosed ring cairn is 18m in diameter with a clearly visible central space, 6.3m in diameter; the cairn has been augmented by field gatherings. 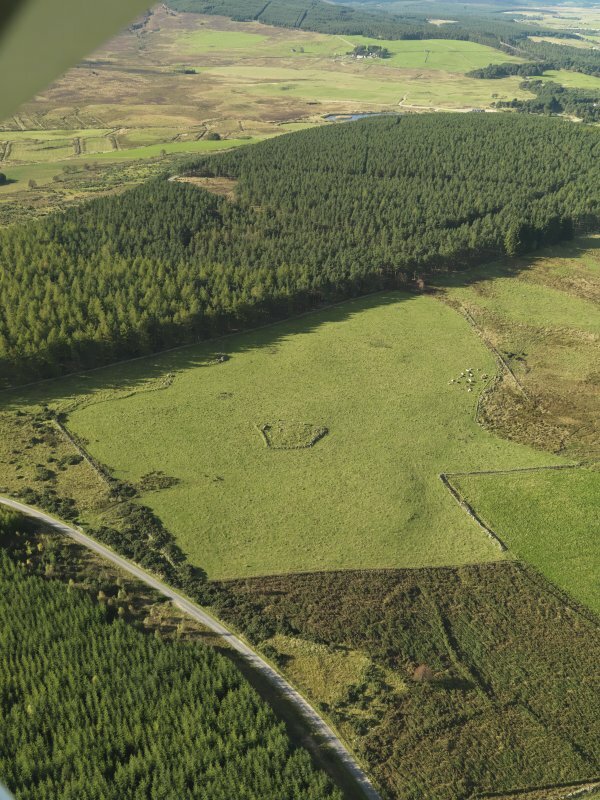 The recumbent, 2.9m long, is slightly east of south, like other Deeside recumbent stone circles. 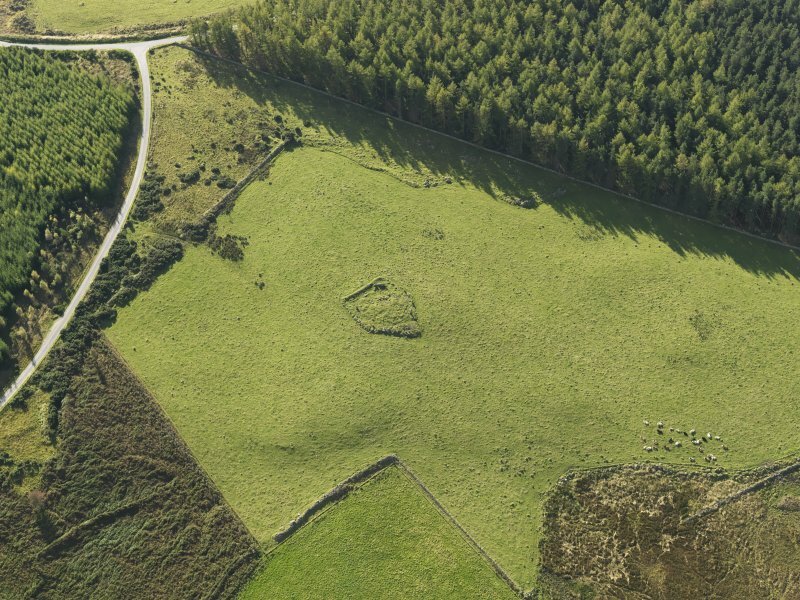 Two lines of stones run from the ends of the recumbent to the perimeter of the ring cairn, creating a 'reserved area' similar to East Aquhorthies (no. 100) or Loanhead (no. 98). 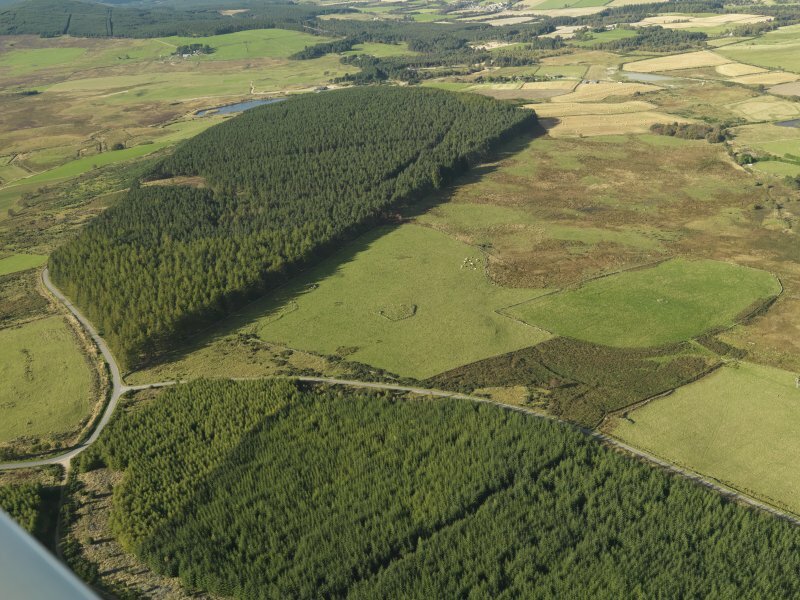 The circle is intervisible with another, Eslie the Lesser, 0.8km to the north-east (NO 722921), which is 15.3m in diameter and is located on a shoulder 20m higher than Eslie the Greater. This well-preserved recumbent stone circle stands at 180m OD just below the crest of a low saddle with wide views to the south and west. 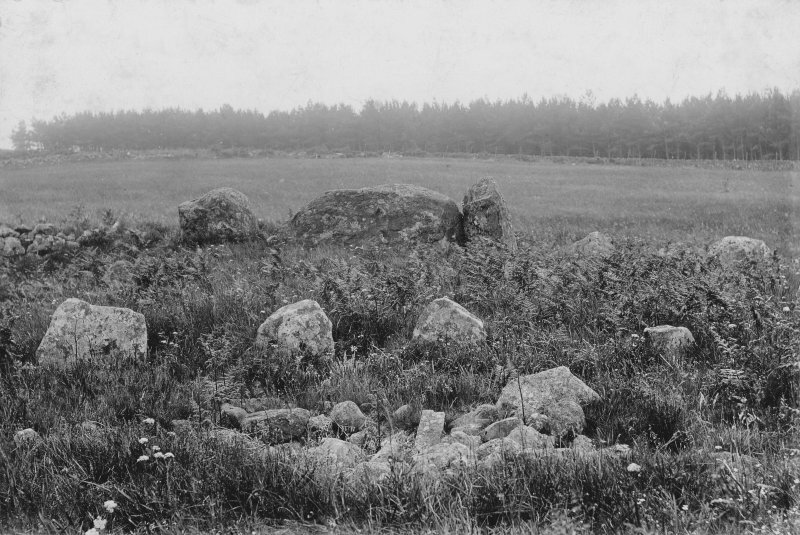 Of the eight original circle stones (plus recumbent and flankers), five still stand; they range from 1.5m to 0.8m in height, the one opposite the recumbent being, characteristically, the smallest. In plan the circle is an ellipse, 26.5m by 23.2m. 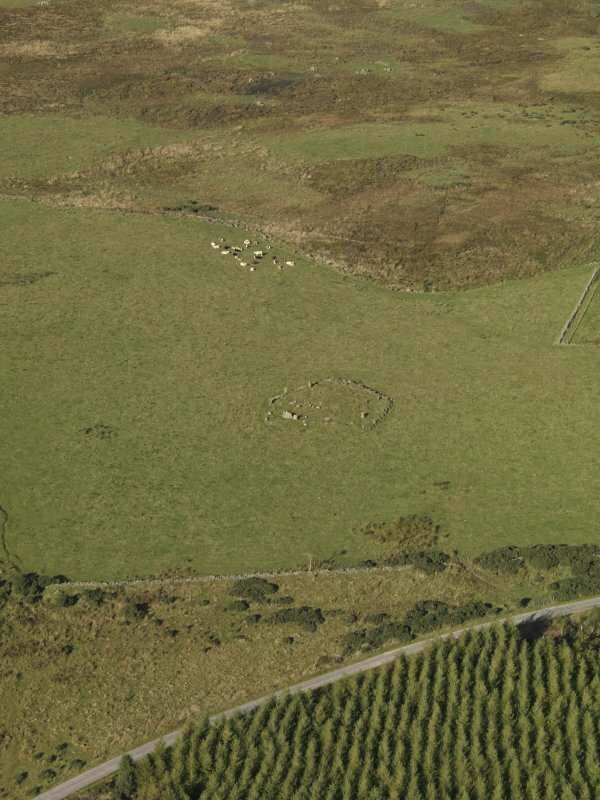 The enclosed ring cairn is 18m in diameter with a clearly visible central space, 6.3m in diameter; the cairn has been augmented by field gatherings. 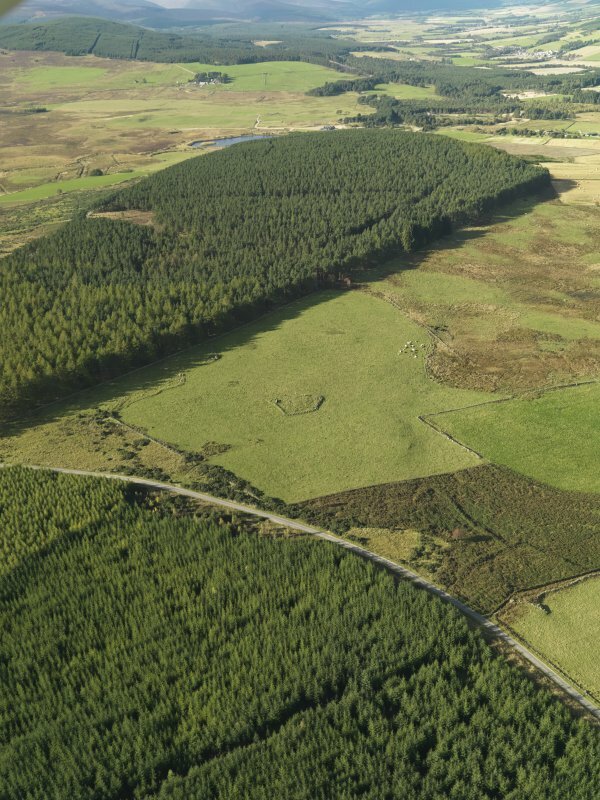 The recumbent, 2.9m long, is slightly east of south, like other Deeside recumbent stone circles. 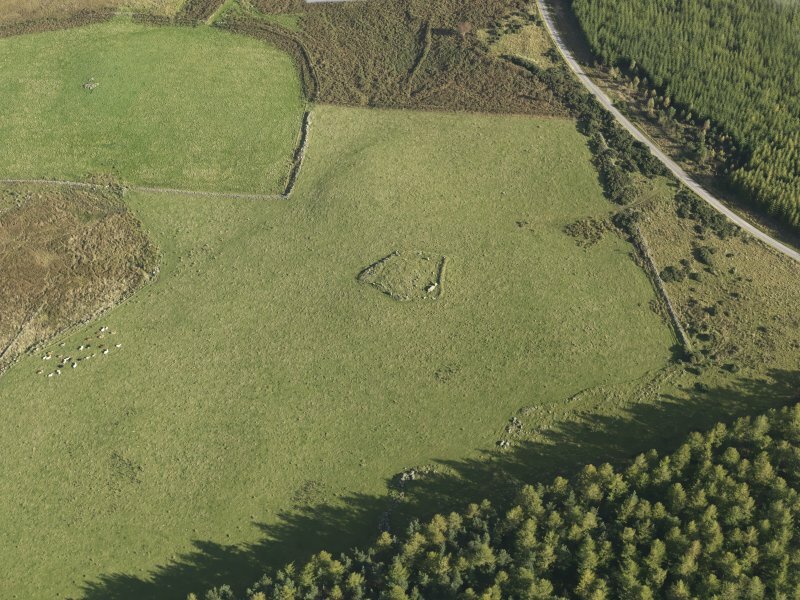 Two lines of stones run from the ends of the recumbent to the perimeter of the ring cairn, creating a 'reserved area' similar to East Aquhorthies (no. 100) or Loanhead (no. 98). 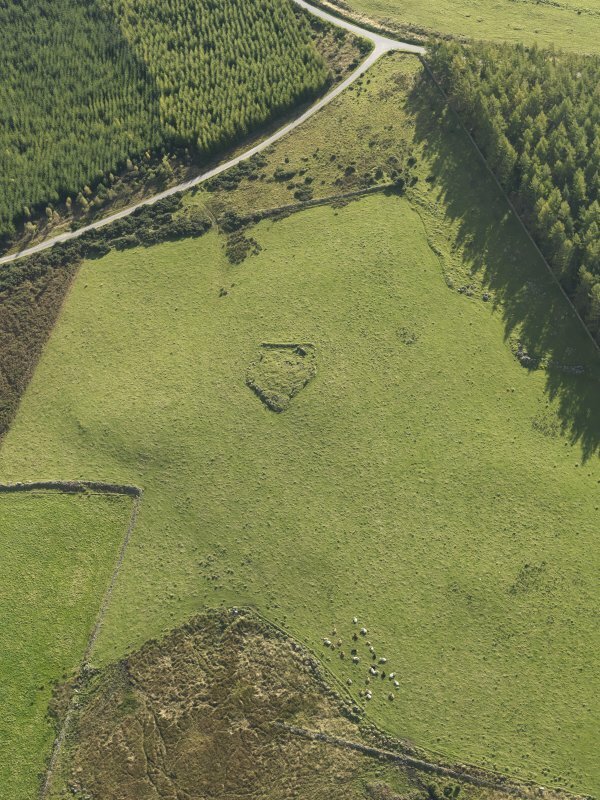 The circle is intervisible with another, Eslie the Lesser, 0.8km to the north-east (NO 722921),which is 15.3m in diameter and is located on a shoulder 20m higher than Eslie the Greater. 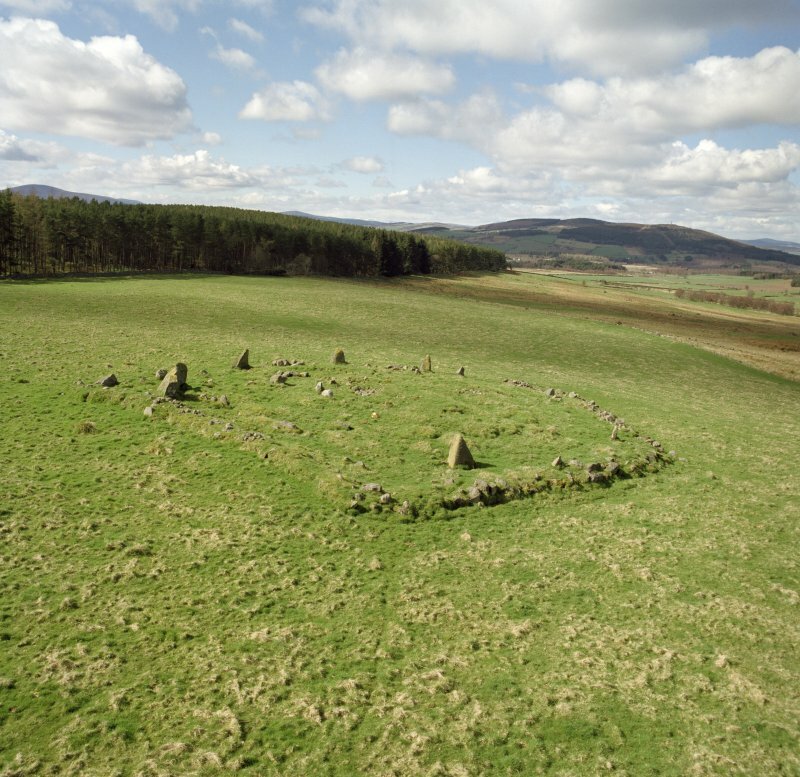 Situated in a small patch of rough ground, this recumbent stone circle lies in the improved pasture on the E side of the saddle between Knock Hill and the ridge rising eastwards to Mulloch Hill. The general trend of the ground falls away to the NW and the circle is set astride a natural N-facing scarp. 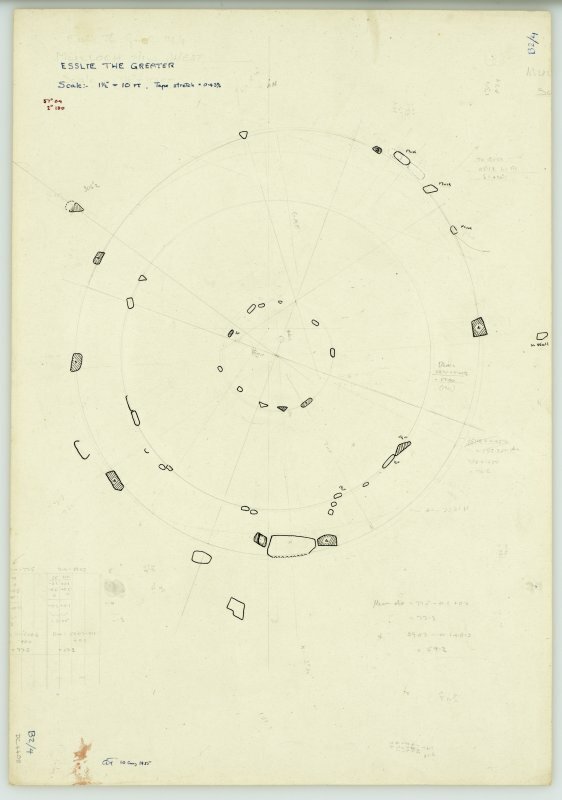 Measuring about 24m in diameter, it originally comprised twelve stones, but four of the orthostats are now missing and the ring-cairn within the interior is also heavily robbed. The recumbent (2) lies on the SSE of the ring, though the setting itself faces S. A rough boulder with an uneven summit sloping down to the E, it measures 2.9m in length, and at 1.4m in height it is not much lower than its flankers. The western flanker (1), which has lost a fragment off the back of its top, is a slender pillar 1.6m high, contrasting with its broad, squat neighbour 1.05m high on the E (3). Both are set back from the leading face of the recumbent and turned slightly as if to trace the arc of the circle. 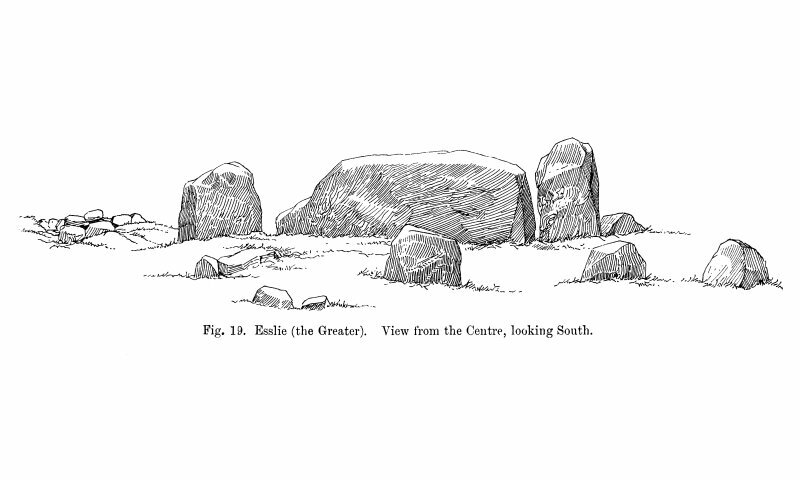 The five orthostats surviving upright (4–8) indicate that the stones are set out at intervals of between 5m and 6m, and are consistently graded to reduce in height northwards to a stone only 0.9m high on the NNE (5). In addition to these five there is an orthostat immediately outside the circle on the WNW (A). Canted over to the NW, but with its SE end still embedded in the ground, it was almost certainly once upright in this position, where it has been for at least 140 years (see below); that said, its N edge appears to have been split lengthwise, and it is possibly one of the missing orthostats of the ring that has been re-erected. 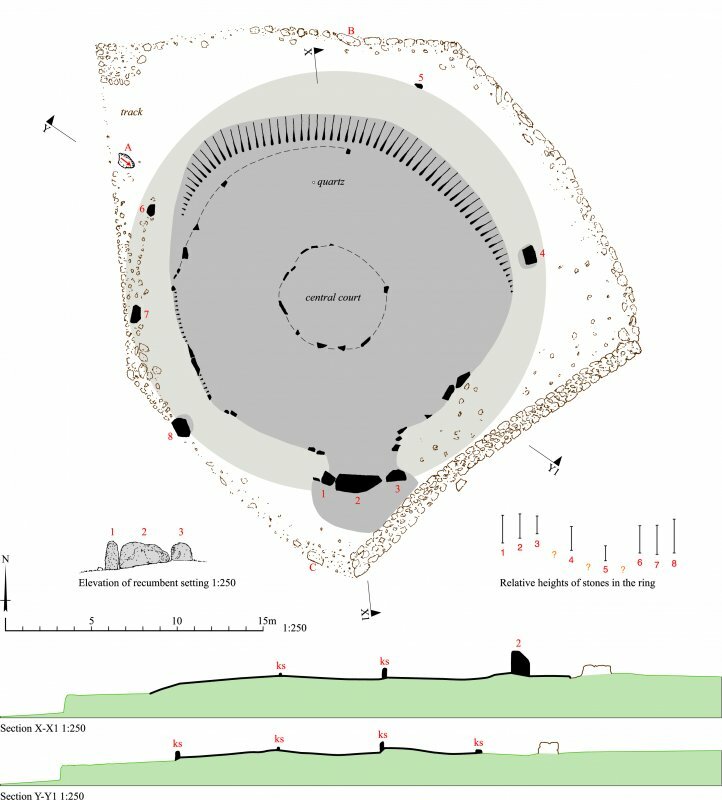 The ring-cairn within the interior now forms a flat-topped mound up to 0.8m high. It measures roughly 18m in diameter over an outer kerb of slabs and boulders that turns outwards on the SSE to meet the back of the recumbent setting; with the skewed position of the recumbent, the E arm of the projecting kerb is almost twice as long as the W arm. The central court is 6m in diameter and, in contrast to the outer kerb, the eleven remaining stones of its kerb appear to be graded to increase in height towards the S. Excavations in 1873 revealed a masonry cist in a pit at the centre of the court (see below). The only other feature of note is a small slab almost flush with the ground immediately adjacent to the W flanker. 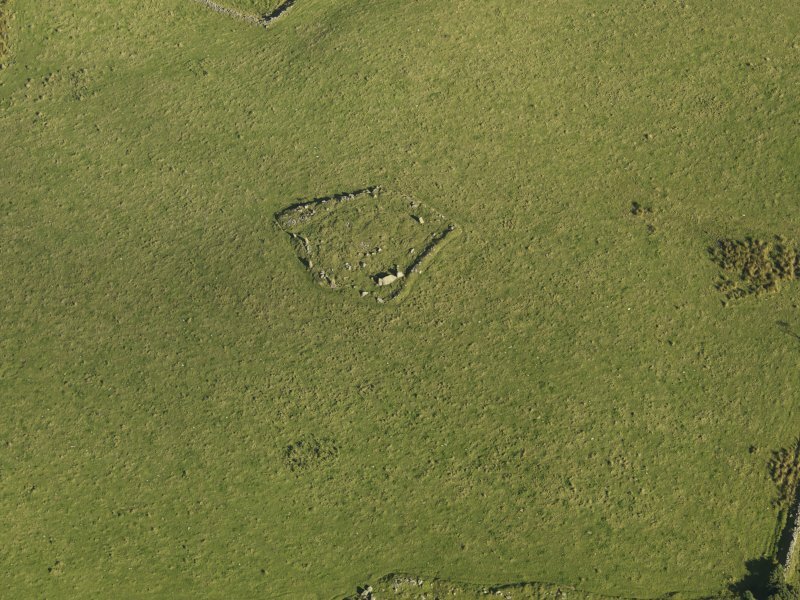 It has the appearance of a kerbstone and in this position hints at the presence of a platform of cairn material between the ring-cairn and the surrounding circle, though no such feature can now be detected beneath the field clearance that is strewn around the margins of the ring.